Royal Wedding Cake- Harry and Meghan's cake- suggestions? The Royal Wedding Cake for Harry and Meghan- Our Suggestions. Over the last few years, some of our brides and grooms have been looking for a cake to match in with a more relaxed or rustic wedding mood, most recently inspired by the wedding of Prince Harry to Meghan Markle. Please see our recent Rustic Wedding Cakes Blog for lots of practical examples of naked and butter-cream wedding cakes. 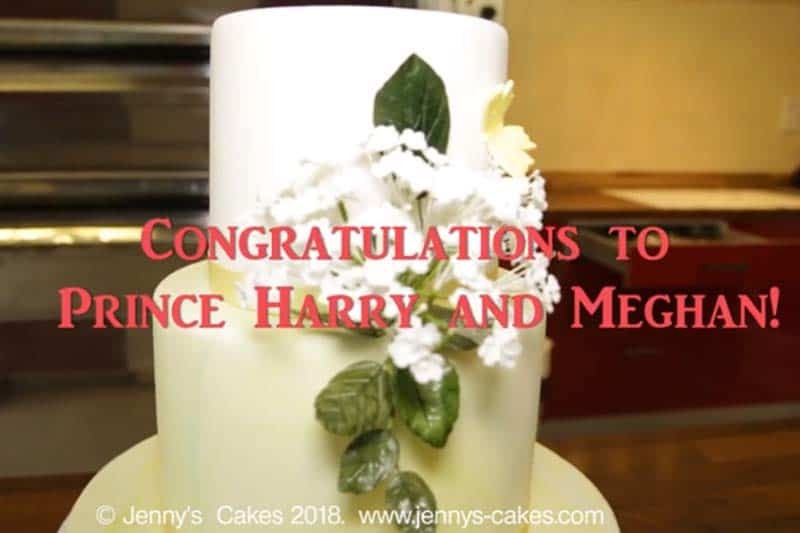 The recent royal wedding of Prince Harry and Megan Markle’s and their butter-cream wedding cake choice confirms this trend. We have made lots of butter-cream wedding cakes, but perhaps butter-cream and fresh flowers are not the best combination! The main concern is that butter-cream is quite soft, and can become even softer during hot weather. The use of fresh flowers can also be tricky, as many flowers are non edible and some may actually be dangerous! Here is a short list of flowers that are poisonous to humans, including Hydrangea and Lily of the Valley! We really do understand that many brides and grooms have a detailed vision for their country style or rustic wedding. This may well involve a wedding cake with a butter-cream coating. In the spring or autumn, this option makes perfect sense, but there can be some difficulties in the summer. Temperatures (even in Scotland) have reached over 30 degrees- in these temperatures, butter-cream is prone to softening and possibly even melting! We have created a perfect solution! The cake shown here is decorated with a (slightly) softened and pallatable Royal Iced finish, thoroughly heat-stable but still with the rustic look. The wedding cake shown here is a four-tier round stacked design, with layers of gypsophilia and a domed cake topper. We had some concerns about the problems with butter-cream cakes combined with fresh flowers, and put our thinking caps on. We have designed a wedding cake which brings together the lemon and elderflower themes in a different way! We have coated the cake in a marbled finish with a blend of white and lemon sugar-paste, and decorated the cake with a spray of sugar-crafted elderflowers and leaves. 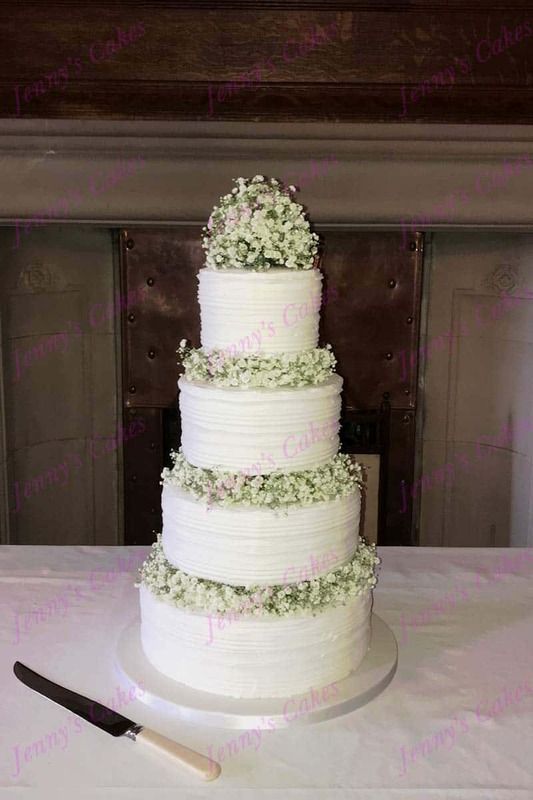 The ‘Harry and Meghan’ alternative wedding cake we have designed and shown below is quite small, but can be upscaled to suit a larger wedding. 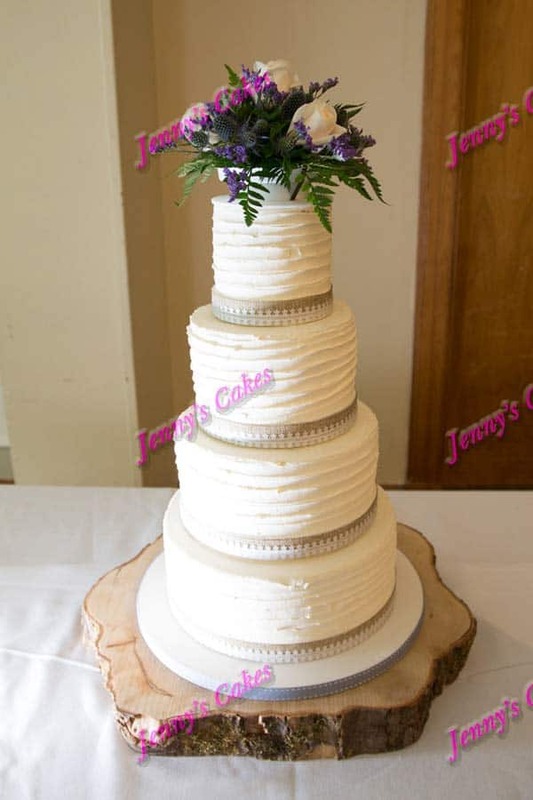 The photo below shows a four-tier Wedding cake with ridged butter-cream in a white finish, with burlap ribbons with lace overlay, topped with a spray of fresh thistles and cream roses. The fresh flowers are in a pad and do not come into contact with the cake, and can be easily removed. We are very happy to advise future brides and grooms to be on the practicalities of butter-cream wedding cakes, so please get in touch if you would like to discuss your wedding cake ideas with us!